Celebrating the life of THOMAS J. KEATING,SR. 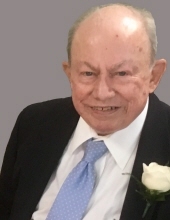 Obituary for THOMAS J. KEATING,SR. Beloved husband of the late Jo-Anne (nee Loftus). Dear father of Mary Anne McKay, Kathleen “Kakie” Keating (deceased), Margaret Mary ”Peggy” Wise, Thomas J. Keating Jr. (Kathy), John F. Keating (Debra), and Nancy J. Keating (Jodi Penwell). Loving grandfather of Erin (Ray), Brian (Danielle), Meghann (Ed), Colin (Sarah), Brenden (Ashley), Matthew (Katherine), Virginia , Scott, Aaron, Sean (Kailie), Luke (Tessa). Step grandfather of, Jim, Lisa, David, Jennifer, Kerri, and Kevin; and he was blessed with 13 great-grandchildren. Brother of Marge Krivonak, Mary Malloy, John "Jack" (deceased), Bob (deceased), Chuck, Jim, Frank, Larry, Michael, Patty Blavat, and Ron. Uncle and great-uncle, and son of the late Francis J. and Margaret C. Keating (nee McGervey). He was a US Army Veteran; 60 year member of the Knights of Columbus; and he never missed a chance to photograph a beautiful sunset. Passed away January 17, 2019. Funeral Mass Saturday, January 26, at St. Mel Church( 14436 Triskett Rd., Cleveland) at 10:00am. (Please meet at church.) Interment Holy Cross Cemetery. FRIENDS MAY CALL IN THE MCGORRAY-HANNA FUNERAL HOME of LAKEWOOD, 14133 DETROIT AVE., FRIDAY 4-8PM, and SATURDAY AT CHURCH FROM 9:30 UNTIL MASS TIME. Memorial contributions may be made to a charity of your choice. "Email Address" would like to share the life celebration of THOMAS J. KEATING,SR.. Click on the "link" to go to share a favorite memory or leave a condolence message for the family.